Stars Set for Rehearsals at Miami’s American Airlines Arena. Cardenas Marketing Network (CMN) and the stars of this summer’s hottest Latin music tour, GIGANT3S, featuring international pop icon Chayanne, acclaimed singer/producer Marc Anthony, and Latin America’s preeminent singer/songwriter Marco Antonio Solis, are set to kick off their wildly anticipated tour on Friday, August 3 from Miami’s American Airlines Arena. The award-winning artists will begin rehearsals later this month in Miami for an unprecedented tour that will take them to 16 cities across the U.S., including New York, Atlantic City, Chicago, Orlando, San Antonio, Houston, San Jose, and Las Vegas, among others. CMN, which is producing the entire tour, also announced that the Dominican Republic Ministry of Tourism is sponsoring the GIGANT3S shows in Miami and New Jersey. Fans can purchase tickets to the GIGANT3S tour by visiting http://www.ticketmaster.com or calling 1-800-745-3000. "Being in front of an audience is special, but doing it along with Marco and Marc will be unforgettable. In some ways we are very different, but when it comes to putting on a great show for our fans, we have very much in common. Plus, we’ve got a few surprises in store for everyone", said the multi platinum Chayanne, who is renowned for his live performances. The three artists start rehearsals at the American Airlines Arena at the end of the month. To download photos of the artists or to see the full GIGANT3S schedule, visit http://www.gigantestour.com, or follow the tour @GIGANT3S. Founded in 2003 by Henry Cardenas, CMN is the leading multicultural event marketing and sponsorship agency in the U.S. CMN creates brand impact through award-winning campaigns featuring music, sports and other interactive experiences that capture the hearts and minds of millions of consumers across the nation. In 2011 CMN produced more than 2,500 live events, including concerts, experiential campaigns and mobile marketing tours for clients such as Wm. Wrigley Jr. Company, Anheuser-Busch, H&R Block, General Motors and Goya, among others. With offices in Chicago, Los Angeles, Miami and New York and a dynamic, results-driven multicultural team, CMN applies strategic thinking and flawless execution to deliver value for clients anywhere in the country. Dominican Republic’s first tourist was Christopher Columbus in 1492. Rich in history, the DR has developed into a diverse destination offering both Dominican and European flavors to more than one million U.S. visitors each year. Named #1 Golf Destination in Caribbean & Latin America by the International Association of Golf Tour Operators, the DR boasts 28 designer golf courses, upscale resorts, pristine nature, and sophisticated cities and quaint villages filled with warm Dominican people. The DR features the best beaches, fascinating history and culture, and is a chosen escape for celebrities, couples and families alike. Visit Dominican Republic Ministry of Tourism’s official website at: http://www.GoDominicanRepublic.com. Marc Anthony has sold over 12 million albums worldwide, making him one of the most influential artists of his time and a true ambassador of Latin music and culture. He has been awarded countless Standard gold and platinum certifications from the Recording Industry Association of America (RIAA). His influence was significantly recognized when he was included in the Top 10 List of influential New Yorkers compiled by New York Magazine. The Miami Dolphins minority owner, who has also established a highly credible acting résumé, was recognized with a Lifetime Achievement Award by the Congressional Hispanic Caucus Institute in Washington D.C. in September 2009. In 2011 he embarked on a world tour and returned to the hit TV series HawthoRNe (TNT) while also launching his new clothing and accessories line at Kohl’s. He announced the creation of his non-profit organization, the Maestro Cares Foundation, in January 2012 and last month he received the ASCAP Founders Award for his exceptional contributions to music. For more information, visit http://www.marcanthonyonline.com. Mexican-born Marco Antonio Solis is one of the most important and successful singer-songwriters in Latin music, and his compositions, recorded by himself and covered by scores of other artists, have literally shaped the direction of Latin music in Latin America and the U.S. As the leader of the most influential group of its time, Los Bukis, and as a solo artist, he has recorded over 20 albums and written over 300 songs, had numerous Platinum albums in the United States, Mexico and Latin America, plus had a string of radio hits, many of them having reached the No.1 position on Billboard’s ‘Hot Latin Tracks’ chart, making him one of the few artist who has enjoyed tremendous success in both the pop and regional charts. 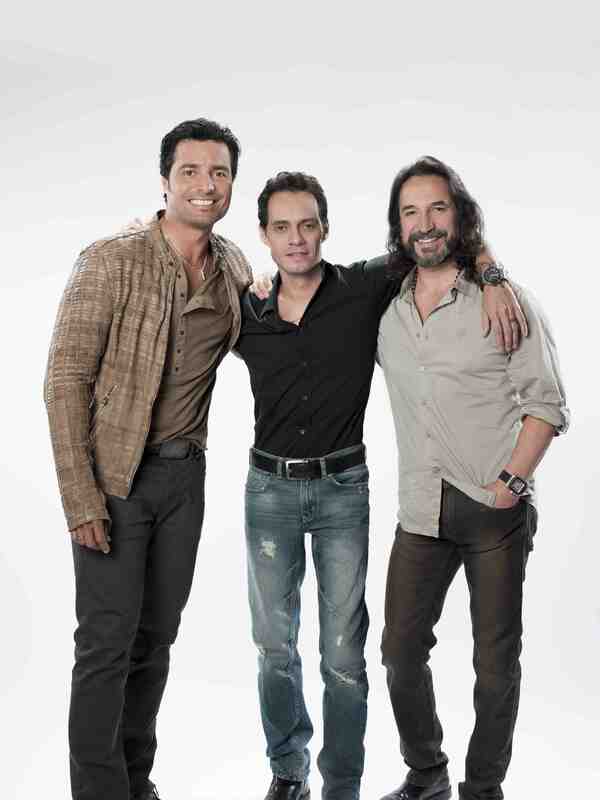 For more information visit http://marcoantoniosolis.com. With over 70 Gold and Platinum albums to his name, Elmer Figueroa, known simply as Chayanne, has received a multitude of musical recognitions including two GRAMMY® Award nominations. As a solo artist, he has released 21 albums and sold over 20 million albums. He has also starred in three feature films, including the romantic favorite “Dance With Me” alongside Vanessa Williams. A child prodigy, Chayanne began to sing at the age of 10 with the boy band Los Chicos. He made his mark as a solo artist in 1987 with the self-titled album, “Chayanne.” His next album proved to be more successful, as the singles “Este Ritmo Se Baila Asi” and “Tu Pirata Soy Yo” reached the top of the charts. In February 2010 Chayanne released his latest studio album, No Hay Imposibles, featuring the single, “Me Enamore De Ti, which served as the theme for the Mexican novela, Corazon Salvaje. Chayanne has also been honored as an Ambassador to the United Nations For the Immigrants Foundation. For more information visit http://www.chayanne.com.